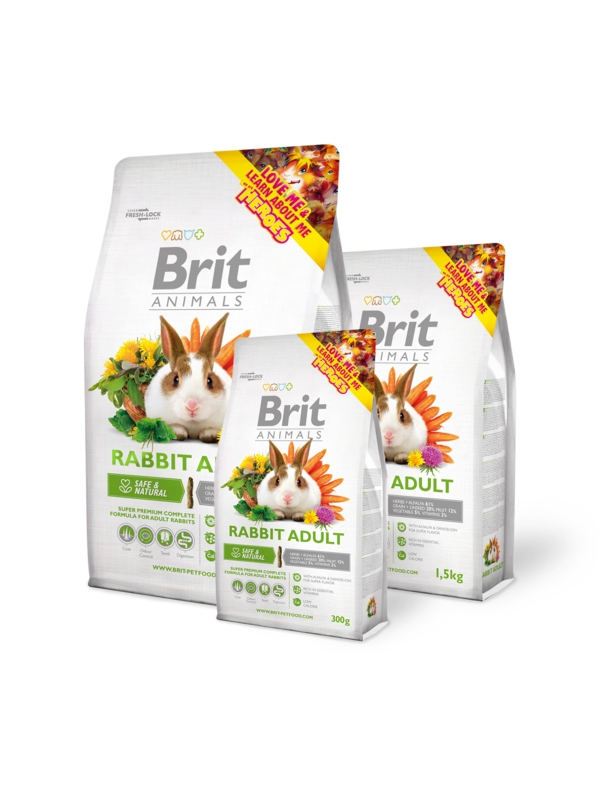 Super premium complete food for adult rabbits (20 weeks – 4 years of age). Optimal ratio of proteins, fats, and fiber ensures ideal digestibility and nutritional value of the food for the adult period. Milk thistle (Silybum marianum) support the proper liver function and helps to prevent most often metabolic diseases. Complete in vitamins & nutrients for vitality & great condition. alfalfa, herbs (nettle, dandelion, plantain), dried apples, barley, carrot, corn, wheat, linseed, brewer´s yeast, mannan-oligosaccharides (75 mg/kg), fructo-oligosaccharides (50 mg/kg), milk thistle (50 mg/kg), Yucca schidigera extract (45 mg/kg). crude protein 14,0 %, crude fat 2,8 %, crude fiber 20,0 %, crude ash 8,4 %, moisture 10,0 %, calcium 0,7 %, phosphorus 0,4 %, sodium 0,06 %. vitamin A10 200 I.U., vitamin D3 1 250 I.U., vitamin E (α-tocopherol) 70 mg, vitamin C 80 mg, vitamin K 0,1 mg, vitamin B1 1 mg, vitamin B2 2 mg, vitamin B3 6 mg, vitamin B5 3,5 mg, vitamin B6 1 mg, vitamin B9 0,12 mg, vitamin B12 0,02 mg, biotin 1 mg, choline-chloride 200 mg, zinc 72 mg, iron 40 mg, manganese 54 mg, copper 10 mg, iodine 1,8 mg, selenium 0,21 mg.